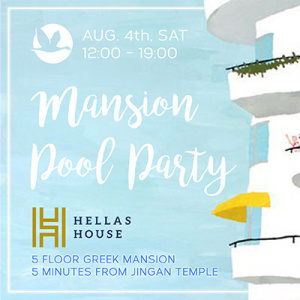 join us for one of the most exciting events of the year... a big terrace pool party at a five-floor private Greek mansion located in the heart of Shanghai! Woohoo! We will have very special exclusive access to this stunning mansion that has been newly renovated and opened last month. Entry fee includes three Greek food dishes and one glass of wine. There will be a pool bar as well as additional Greek souvlaki (Skewers) BBQ starting at 35rmb. The mansion is a “Greek Cultural Center” and is littered with iconic columns and Greek art, bust of poets and philosophers, and marble statues from the Cycladic Period. http://www.tryclearcut.com/event/KG … Prepay before July 31th for a 10% discount. Dress Code is Swimwear, bikinis, trunks, or white/blue linen. We are looking very forward to see you!